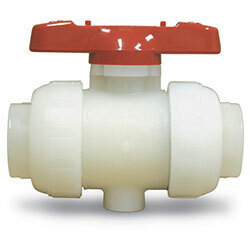 Asahi/America True Union ball valves feature a double O-ring stem design. The upper O-ring groove is deeper than the lower groove, so if the stem breaks, it breaks at the upper groove, leaving the lower O-ring to prevent leakage. All valves listed are also available with actuators; contact USABlueBook for more information. You can also add Asahi actuators at any time without removing the valve from the line.